Our Dinner Time with the Constitution and Signers Theme Kit includes: • 39 color Constitution Signers' biography cards. Each card has the individual picture of the signer, and shows with an arrow, where they are in the famous painting by Howard Christy (helps identify with your signer); • 39 color nametags, for the thirty-nine signers of the U.S. Constitution; • 51 Constitution Cards which includes the 27 amendments. • 1 Quill pen and vellum overlay sheet, to facilitate your "Re-signing of the Constitution of the United States" • 1 Constitution Signers Scavenger Hunt Quiz for the children; • 1 copy of the United States Constitution; • U.S. Constitution signature placement chart (so you can find whose signature is where); • 1 included but optional "Town Hall Meeting Concerns" script and learning exercise. This kit can be used in 3 ways! Dinner Time with you Family: Use this learning tool once a day or once a week with your children or grandchildren. Use it when your babysitting your grandchild or just going to dinner. Each "Constitutional Meal", allows the participant to be a different "Signer", and learn about those "Signers" or "Aspect of the Constitution", ending with the reward of resigning the Constitution with a quill pen! Home Schoolers & Churches: Many have used this kit, as a fun learning tool, by letting the student "become" that Signer for the day. For larger classes, the whole class can become the "group of Signers" for the day.The student gets to identify with their Constitutional signer or aspect of the Constitution, by taking on that role for the day or evening. They get to read about and share what they have learned from the included bio cards. Also included, is a educational scavenger hunt quiz. 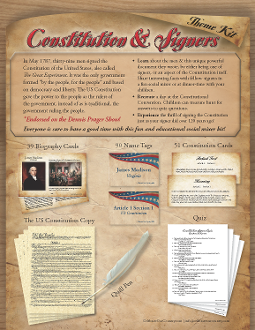 Some schools have used our kit to create a "Constitution Day" or "Constitution Signers Day Camp". Social Mixer: This kit makes a great educational social mixer. Works with 5 people or 105 people. Create a memorable event that your friends and family will never forget. Each participant gets to be a Constitutional Signer or aspect of the Constitution for the day. They get a name tag and bio card. This allows them to play the role of their signer by socializing with others as that person. They do this by reading some interesting points about that signer from the included bio card. From there, you could have a "Town Hall Meeting" to discus the concerns the Signers had back then (skit included). This meeting concludes with an exciting Re-signing of the "Constitution" with a QUILL PEN! There is also a educational scavenger hunt for the children. You can utilize all or some of the many included features. Your "Dinner Time with the Constitution and Signers" will be the talk of the town -- while bringing awareness of the sacrifices that the Signers had to make to create this beautiful country we live in.